The Book of Dragon Lore is an enchanting, beautifully illustrated accompaniment to a series of books that chronicle the adventures of Jack Brenin, finder of the golden acorn. Deep inside Falconrock, hidden from Humankind, is a secret library. None may enter, unless they have permission or know how to open its doors, for it contains all the ancient knowledge of the Druids. 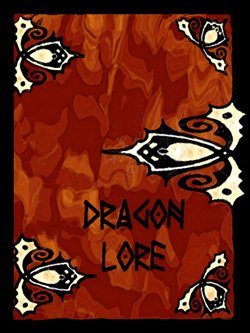 In safe keeping at the library at Falconrock – and belonging to Eleanor, Druid of Glasruhen, Seanchai, Keeper of Secrets and Ancient Rituals, and Guardian of the Sacred Grove – is The Book of Dragon Lore. Gleaned from The Red Book of Lore, the copious notes of Finnik the Delve, and the Bardic tales of long ago, it documents an important part of the history of three worlds. Follow Eleanor’s role in this history in Catherine Cooper’s The Adventures of Jack Brenin… Book 1: The Golden Acorn (2010); Book 2: Glasruhen Gate (2011); Book 3: Silver Hill (2011); Book 4: The Lost Treasure of Annwn (2012); Book 5: The Oak Lord (coming Autumn 2013).